Girls in Aviation Day – Jets in Flight – Saturday, April 20, 9:30 a.m. – 2:30 p.m.
How is it possible that a 20,000-pound vehicle can fly? This question – and others – will be answered as students create physical and conceptual models for aircraft in flight to learn the science behind this engineering. Additionally, these students will fly the T-6 Texan II in NFA’s simulators. The Girls In Aviation Day will conclude with a guest speaker and graduation ceremony. Like the National Flight Academy’s other programs, STEM Saturdays are designed to address the serious concerns of declining science, technology, engineering and mathematics skills in our country. The Academy’s mission is to inspire students to pursue STEM academic and professional paths. Through the STEM Saturday program, the National Flight Academy appeals to younger elementary-aged children. Visit http://bit.ly/2UgxT0a to register as space is limited for each session. Registration opens April 8 and closes April 15 at 5 p.m. Registration is $30 per child and lunch is provided. 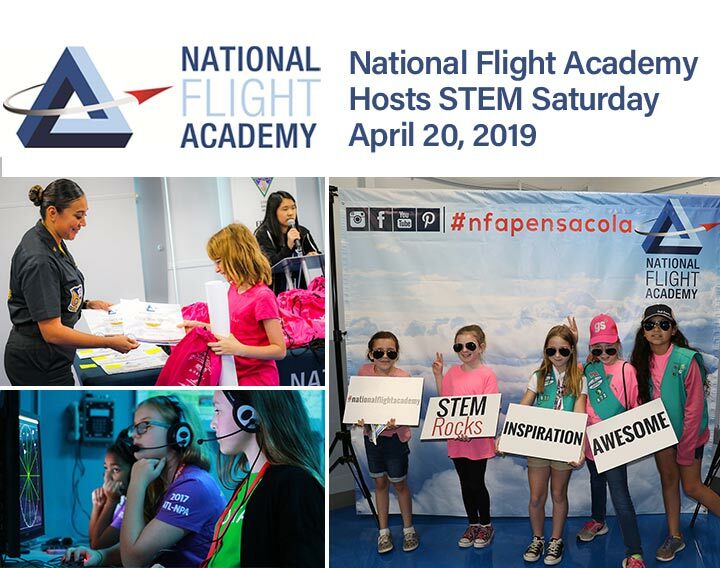 The National Flight Academy, located aboard Naval Air Station Pensacola in Pensacola, Florida, is designed to address the serious concerns of declining Science, Technology, Engineering and Math (STEM) skills and standards in our country. The Academy’s mission is to inspire students who subsequently return to their parent schools and seek out the more challenging courses in Science, Technology, Engineering and Math. The NFA is a self-supporting, tuition-based educational program. We welcome support from individuals, corporations and foundations for both our scholarship program and general operation funds. The National Flight Academy, a program of the Naval Aviation Museum Foundation Inc., is authorized but not endorsed or funded by the U.S. Navy or U.S. Government. For more information about the National Flight Academy, visit http://www.nationalflightacademy.com or find us on Facebook, Twitter and Instagram. Please contact Malerie Shelton, Director of Marketing and Public Relations, via email at mshelton@navalaviationmueum.org for more information.